I like to do my carpaccio tataki style. Although the flavor of a really nice cut of beef is wonderful raw, I think the cooking process greatly enhances the flavor of beef in general. Much like a scallop, the flavor really comes to life if you lightly sear it. When you sear an entire tenderloin for 30 seconds it is still completely raw, but in this recipe, we have now added, wonderful flavors of garlic, lemon, and cracked pepper. The Entire Tender is cleaned, and coated with garlic, cracked pepper, rock salt, and lemon juice. We are not looking to create a crust as most of the ingredients will fall off during the cooking, pounding and presentation process. We are only looking for the flavor. Sear the entire tenderloin in olive oil in a hot pan for about 30 seconds. There should be smoke and lots of sizzling. The pan should be really hot so as to sear the outside without cooking the inside. The timing is easy. Don’t let the garlic burn. Golden brown is the key. After you have seared the tender set it aside to rest for 10 minutes. When the beef has cooled slice it in about 1/4″ pieces. 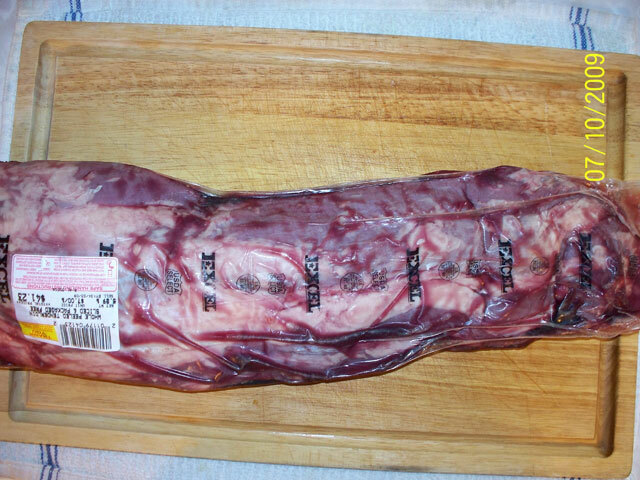 As thin as you can cut it with a sharp knife before the meat begins to fall apart. Take the individual pieces and place them between 2 pieces of plastic wrap. 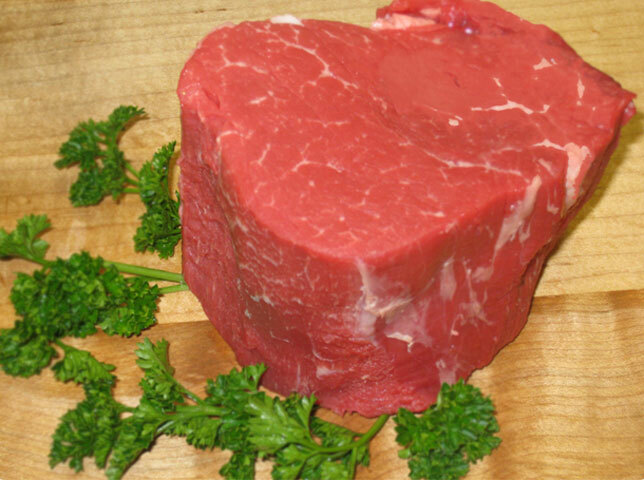 Make sure the plastic is 3-4 times larger than the medallion of beef to allow room for the pounding process. Flatten the medallions of beef on a cutting board or flat surface by gently pounding with the bottom of a small saute pan. The meat should be paper thin. 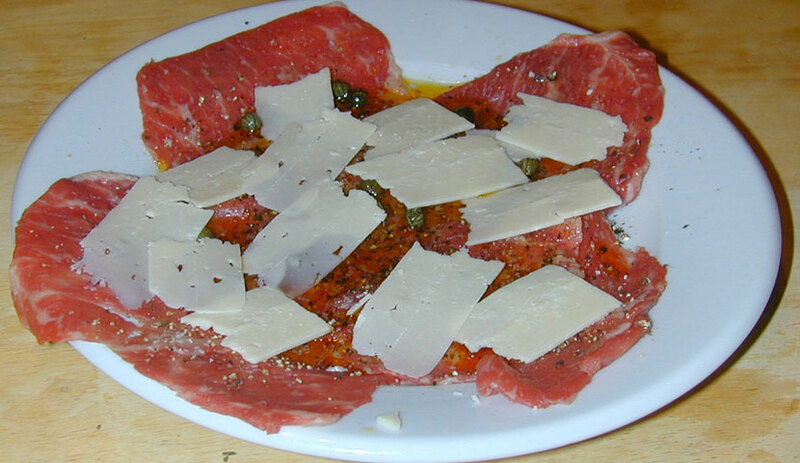 Present the meat flat on a plate with extra virgin cold filtered olive oil, parmesan cheese curls and capers. Fresh Basil sprigs are wonderful as well. I used to serve this recipe with a home made olive loaf cut into toast points. 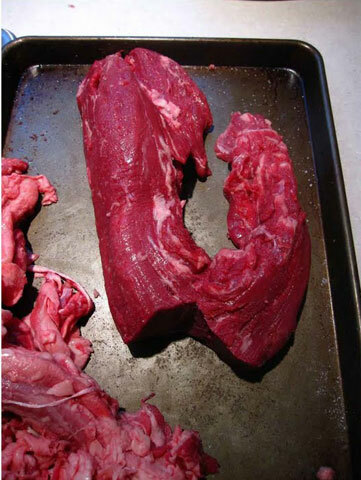 This recipe is for an entire tenderloin but it works just as well for a 4-6oz piece of tenderloin. Just use less crust ingredients and coat only the short side. Mix all ingredients in a bowl and rub on meat trying to get as much as you can to stick. Sear Tenderloin in a hot pan with about 2 TBLspoons of olive oil. Set meat aside to rest for 10 minutes. 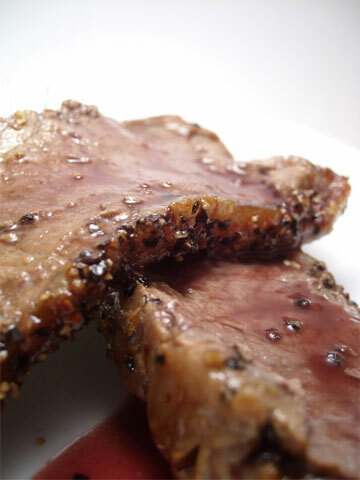 Slice thin then place medallions between Plastic wrap and pound thin with a small saute pan. Refrigerate until ready to present. 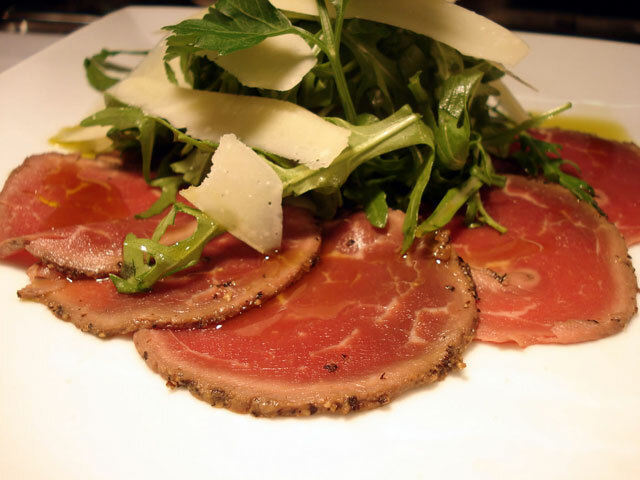 You are currently reading "Carpaccio Of Beef"